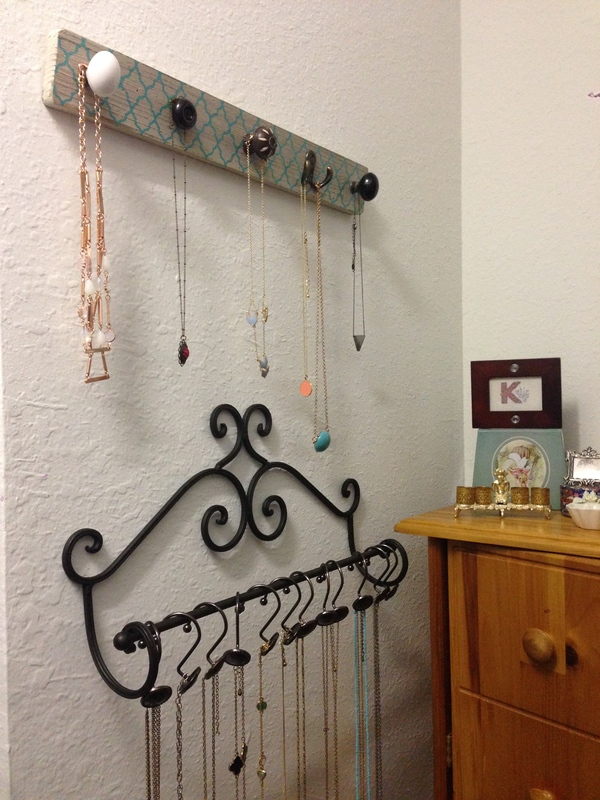 What what… two Pinterest Projects in one week?? Yep… because it’s my birthday 🙂 I’m officially in my late twenties! 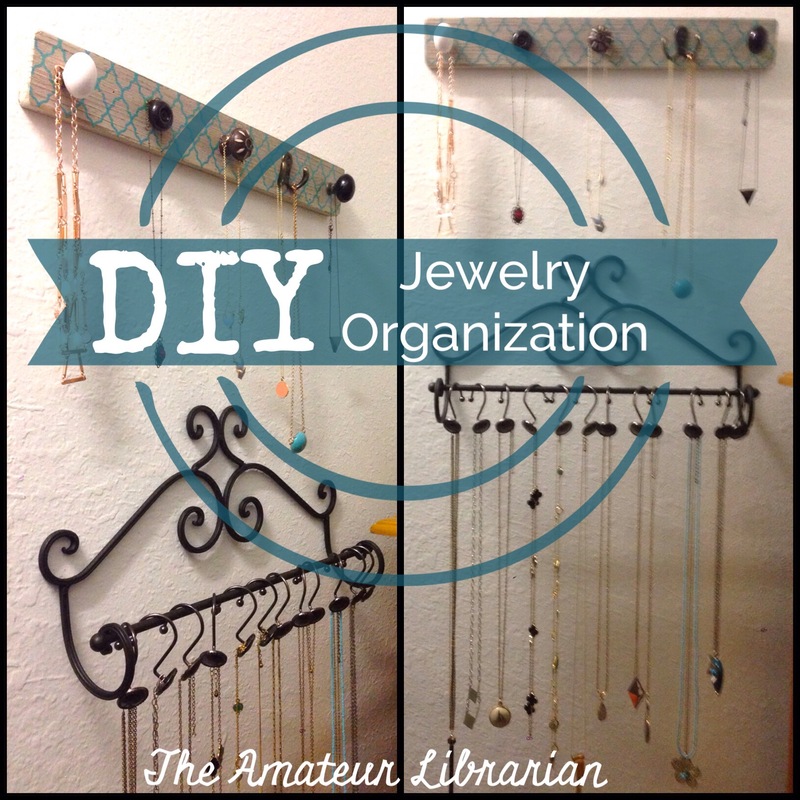 And what better way to celebrate than combining two of my favorite things… jewelry and organization?! 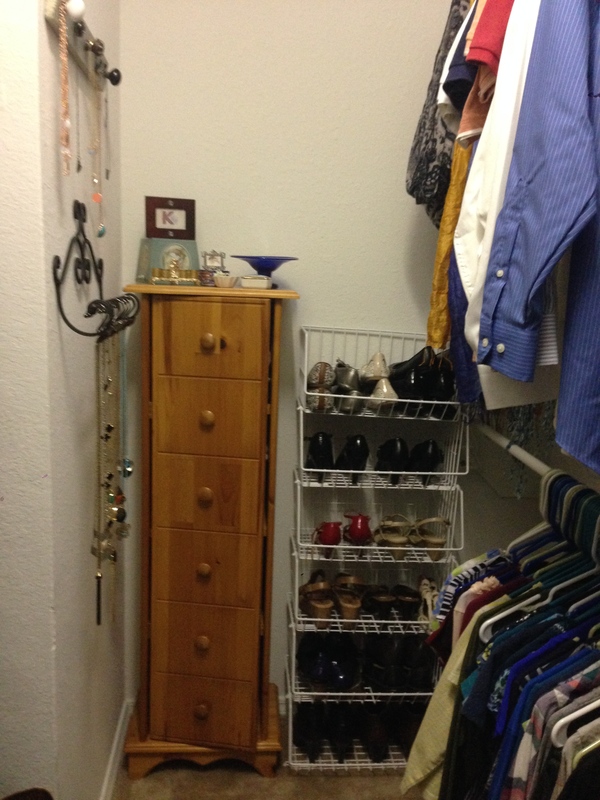 This worked really well for me in San Francisco where there was plenty of wall space but not much closet space. 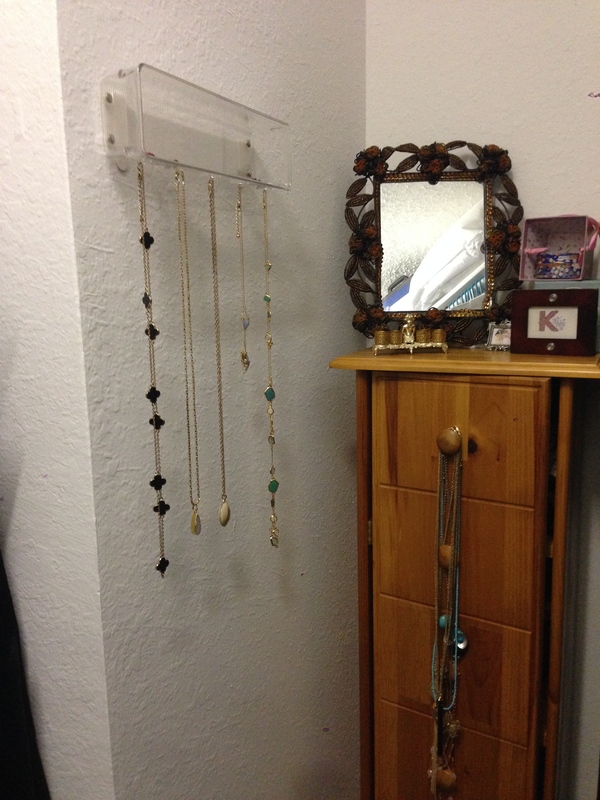 Too many long necklace that ended up tangled and hung on the knobs of that little set of drawers (it holds my socks/underthings). So what’s a girl to do? Consult Pinterest of course! There are so, so many creative ideas out there! The problem is that by the time you buy a piece of wood, paint and distress it, buy five different knobs and attach them, it costs way more than $7… which is exactly how much I paid for one from Hobby Lobby at half price. Sometimes DIY is not worth the trouble! 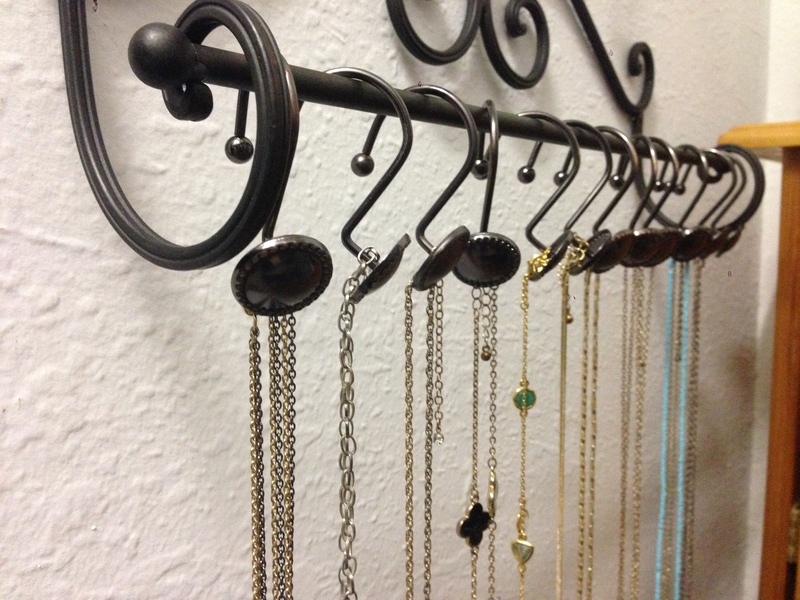 So I used one store bought set of hooks for my short necklaces, and DIY’d a new setup for my long necklaces. 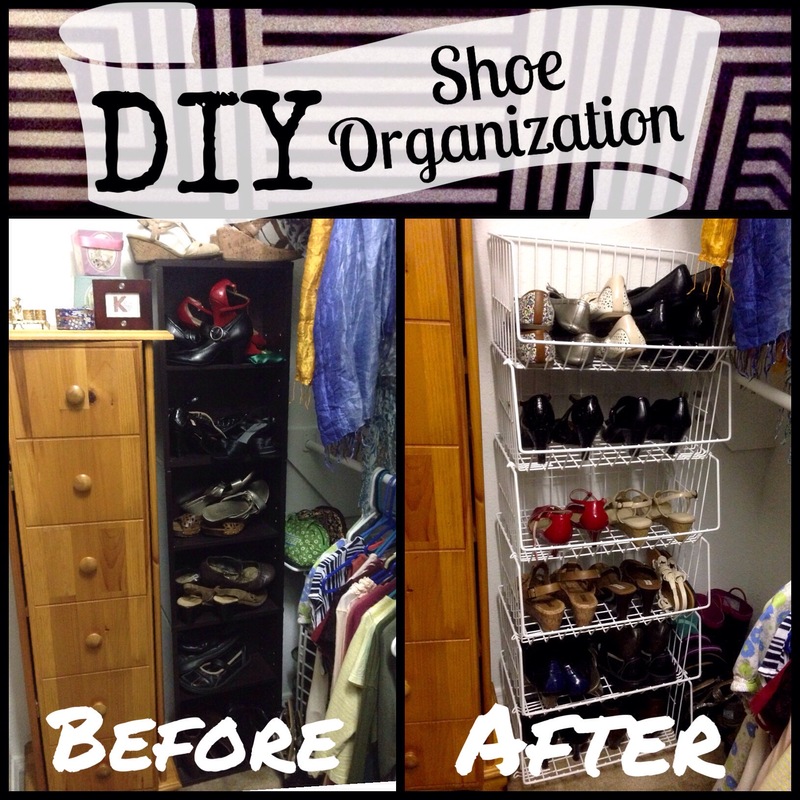 The combination really works well for me and uses the space I have – I love it! So simple, I barely need to say anything! Attach the towel rack to the wall. Hang s-hooks. Tada! I think I actually bought the exact same towel rack from the original pin, but it just happened to be what I found at Hobby Lobby (gotta love those 50% off coupons! 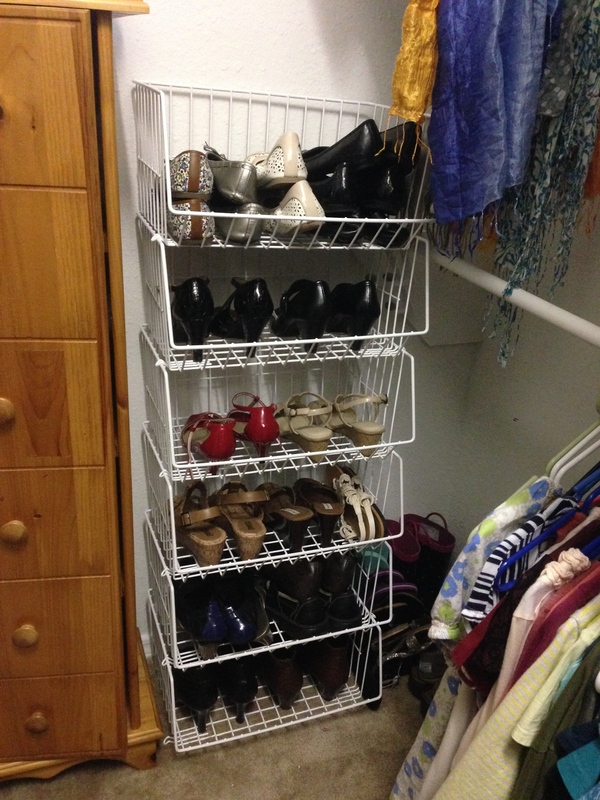 )… it fits the space and it was a great deal. At first I wasn’t sure if I liked the ornate shower curtain hooks, but again it was what I found at the store so it works for me! 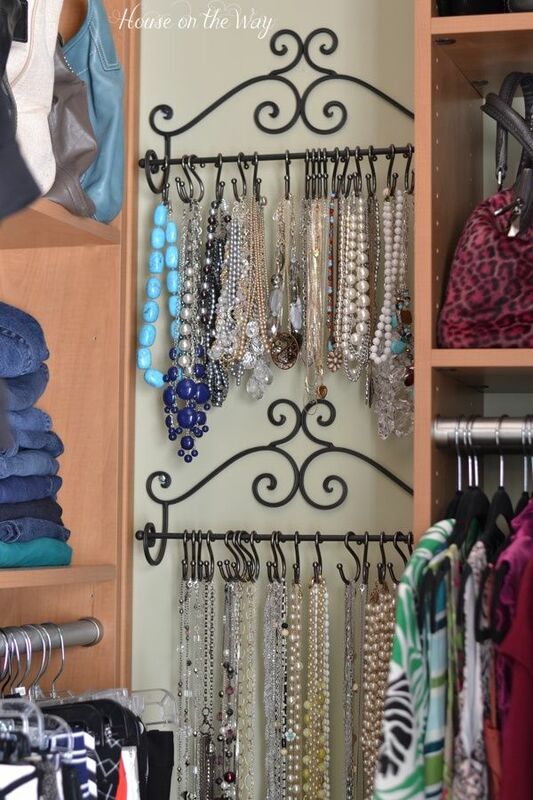 But you could definitely use simple s-hooks instead. 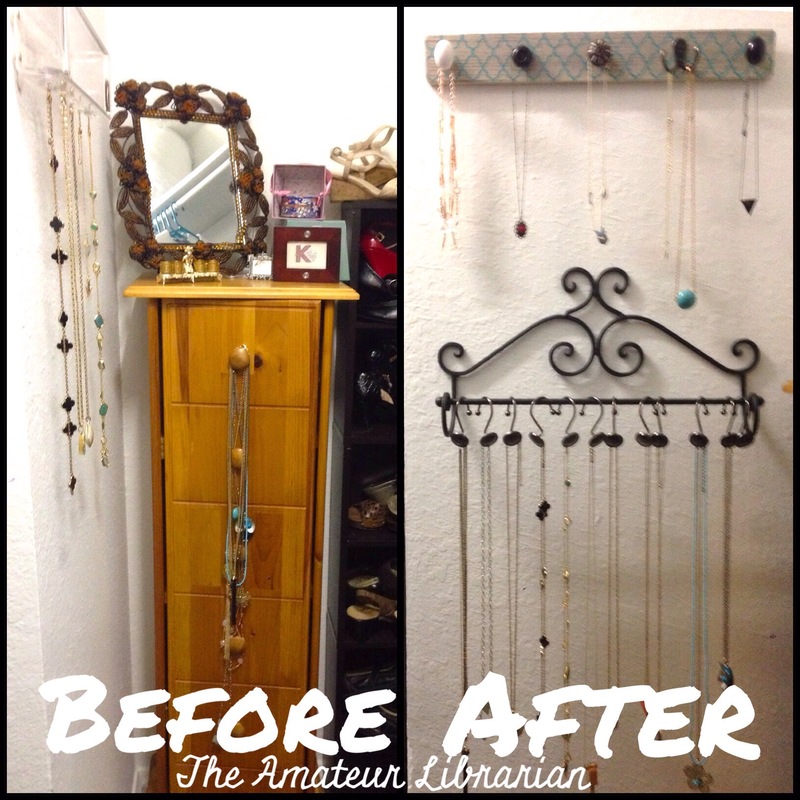 The Before and After is so much more functional! 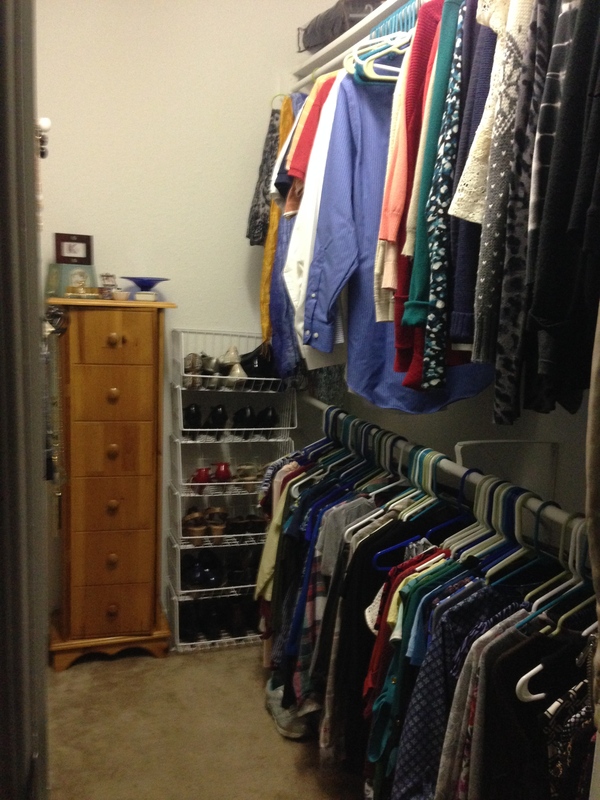 And while we’re in the closet, here’s a quick look around! We had an extra small cabinet used for dvds, so I tried using that at first… what a mess! The shelves were way too narrow and everything kept falling over. I found some stackable shelves that are actually meant for dishes that work perfectly… I can even add more if I need more storage! 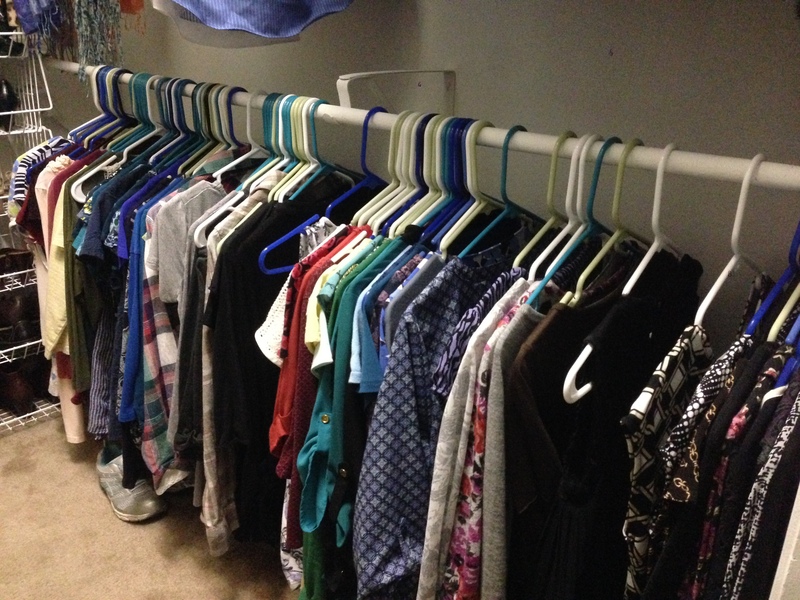 It’s also nice how much brighter the closet feels now that the dark shelves are gone. It’s been a challenge to use the vertical space as much as possible, but I’m happy with this arrangement for now. Works for me! 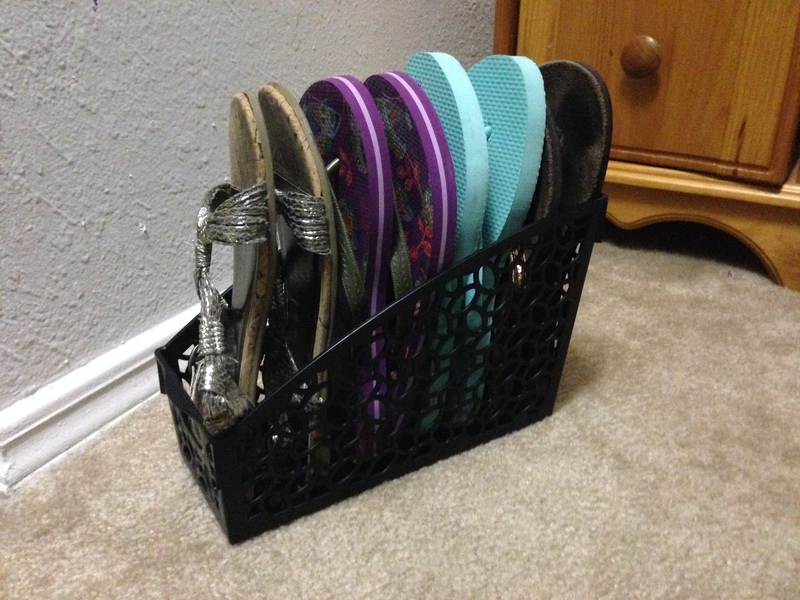 Flip flops in a magazine box! 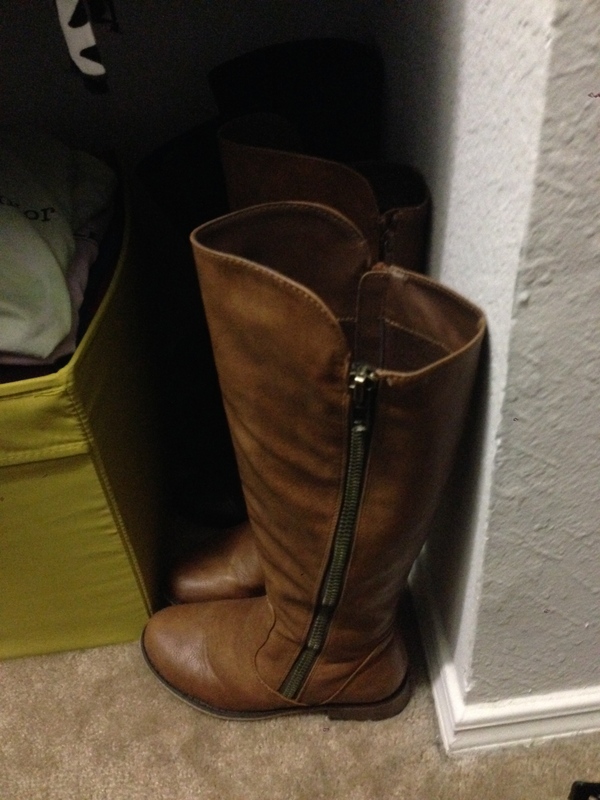 Rolled up magazines to keep boots upright! Organizing tops in order of sleeve (sleeveless, short, long), color, and casual/work… OK, so that one I already did by myself. 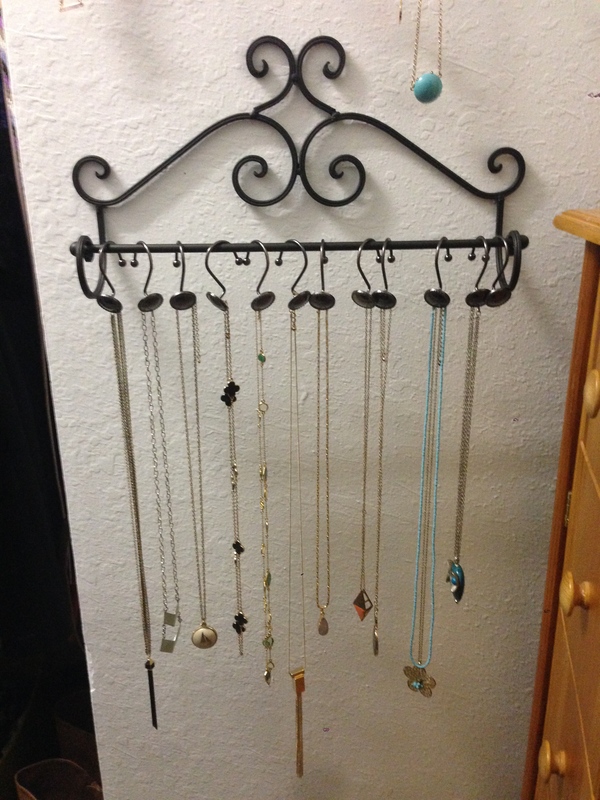 I bought the same wrought iron towel rack from Hobby Lobby. 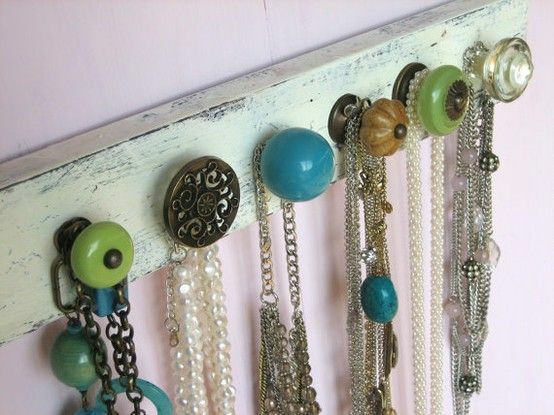 How did you hang yours? I cannot for the LIFE of me figure it out! thanks! I just nailed it into the wall on each end. The jewelry is pretty lightweight, it might not be sturdy enough for towels!